How about that snazzy bling? 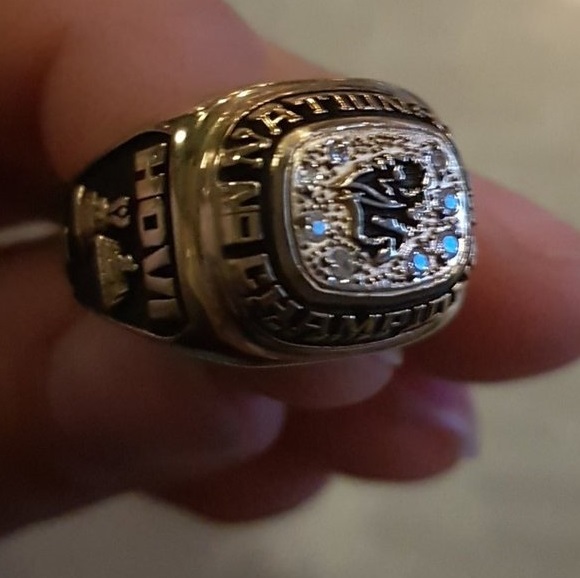 That would be Venla Hovi's ring commemorating her U SPORTS National Championship that were given to the 2017-18 Manitoba Bisons women's hockey team at a post-game celebration following today's win over the Calgary Dinos. It goes without saying that Venla is a pretty special player, having earned a bronze medal at the 2018 Pyeongchang Olympics before hustling back to join the Bisons for Game Two in the Canada West Semi-Final, eventually helping them capture the Canada West Championship and the U SPORTS National Championship. The Finnish Olympian entered the CWHL Draft this summer and was selected by the Calgary Inferno, so the question had to be asked: what's next for Venla Hovi? I had the opportunity to speak to one of the most decorated hockey players to ever wear the Bisons logo after the game, and it's pretty clear that she's looking forward to the next chapter of her life out in Calgary. Venla leaves on Wednesday for the Alberta city to join the Calgary Inferno for the 2018-19 CWHL regular season and beyond, and I have a feeling she'll be playing with Finland in Saskatoon at the 2019 Four Nations Cup in November before returning home to Finland when Espoo hosts the 2019 IIHF Women's World Hockey Championship. "I'm excited to get back out there and play," Venla said, smiling, "but I'm a little scared too. There's so many good players, and I don't really know anyone. I just hope I play well enough." I don't think there's any doubt that she'll play well enough as she's proven on the international stage, and she'll get to play alongside some players who will undoubtedly help her raise her game as she suits up next to Brianna Decker, Zoe Hickel, Rebecca Johnston, Brianne Jenner, and Blayre Turnbull. Hovi has never been one to shy away from raising her game to a new level, and there will be a ton of opportunity to do so at the professional level. From what she said, Hovi will be forced to wear a new number as teammate Dakota Woodworth is currently wearing her familiar #9. It sounds like she settled on #7 as her new choice, and there have been some rather solid players who wore #7 in Calgary before Hovi. American Joe Mullen helped the Calgary Flames win a Stanley Cup while scoring 190 goals in the regular season. A young lady from Edmonton named Brittany Esposito wore #7 for the Inferno prior to this season where she helped the Inferno win the 2016 Clarkson Cup while scoring 83 points in 93 career games. Of course, high-scoring defenceman TJ Brodie currently wears #7 for the Flames. Current teammate Erica Kromm also wore #7 back in the day when the Team Alberta was still a thing as well. Needless to say, Hovi should keep this trend of long-running success for players wearing #7 on the ice in Calgary going! I'm not going to lie when I say that it won't be the same around Wayne Fleming Arena without Venla. Her drive was infectious with the other players both on and off the ice, and her passion for the game might be unmatched as far as I've seen. And in knowing what she's done on the ice at the U SPORTS level and the international level, her smile lit up the rink and she always had time for fans, especially the smaller fans who wanted to meet an Olympian! Calgary is getting a great woman who loves the game of hockey, and I'm sure fans of the Inferno will become enamored with Venla just as the fans of the Manitoba Bisons are. I'm hopeful that the Bisons will take some time to see their former teammate play professionally this season as the Bisons visit Calgary for a date with the Dinos on November 30 and December 1 while the Inferno host the Markham Thunder on December 1 and 2! And if, for some reason, those dates don't work for the Bisons, perhaps they'll consider January 11 and 12 when they visit Calgary to battle the Mount Royal Cougars while the Inferno are at home that weekend against the Toronto Furies! That last set of games could be awesome as there's a chance that Sami Jo Small, General Manager of the Toronto CWHL club, could be traveling with the Furies! Sami cheered from afar as the Bisons captured the U SPORTS National Championship, so it might be a good chance for the Bisons to meet another Olympian from Winnipeg! Of course, Sami Jo Small could be scouting players from the Bisons that weekend, so it might be a good time for a number of seniors to get their A-game in order! I will say it was an honour to be able to call games featuring Venla Hovi as she is a true professional when it comes to her approach on and off the ice. She was a delight to speak with for interviews, she's a wonderful ambassador for the game, and I have no doubt that she'll bring the same passion to the Inferno. Embrace her, Calgary. She's an amazing woman!